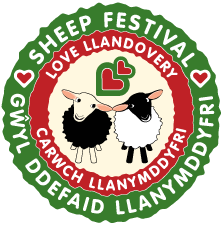 Llandovery welcomes the 5th annual Llandovery Sheep Festival to the town this weekend and it’s set to be a great event. The festival takes places at the Market Square and Castle Fields and throughout the weekend there will be a range of activities to entertain you. Friday night you will be able to choose from Tapas and live Spanish music at The Deli, a Cider Festival in The Castle Hotel or listen to the story of ‘Dark Secrets – Llandovery and the making of the modern World’ also at The Castle Hotel. Saturday you can sample a sheep shearing demonstration, watch the Sheep Dog Trials or enjoy Cooking masterclasses. Throughout the day there will also be entertainment in the Market Square including children’s entertainment, street theatre and choirs to name a few. Sunday sees the activities continue, with some of the main highlights being the UK National Rare Coloured Breeds Auction at the Mart and even a Wool Sack Race! Throughout the weekend there will also be stalls at the Castle Field, so a great opportunity to buy some local craft and food produce. So why not head to Llandovery and contact us at Erwlon to make a weekend of it and bring the tent or caravan with you.